THERE lived not long since, in a certain village of the Mancha, the name whereof I purposely omit, a gentleman of their calling that use to pile up in their halls old lances, halberds, morions, and such other armours and weapons. He was, besides, master of an ancient target, a lean stallion, and a swift greyhound. His pot consisted daily of somewhat more beef than mutton: a gallimaufry each night, collops and eggs on Saturdays, lentils on Fridays, and now and then a lean pigeon on Sundays, did consume three parts of his rents; the rest and remnant thereof was spent on a jerkin of fine puce, a pair of velvet hose, with pantofles of the same for the holy-days, and one suit of the finest vesture; for therewithal he honoured and set out his person on the workdays. He had in his house a woman-servant of about forty years old, and a niece not yet twenty, and a man that served him both in field and at home, and could saddle his horse, and likewise manage a pruning-hook. The master himself was about fifty years old, of a strong complexion, dry flesh, and a withered face. He was an early riser, and a great friend of hunting. Some affirm that his surname was Quixada, or Quesada (for in this there is some variance among the authors that write his life), although it may be gathered, by very probable conjectures, that he was called Quixana. Yet all this concerns our historical relation but little: let it then suffice, that in the narration thereof we will not vary a jot from the truth. You shall therefore wit, that this gentleman above named, the spurts that he was idle (which was the longer part of the year), did apply himself wholly to the reading of books of knighthood, and that with such gusts and delights, as he almost wholly neglected the exercise of hunting; yea, and the very administration of his household affairs. And his curiosity and folly came to that pass, that he made away many acres of arable land to buy him books of that kind, and therefore he brought to his house as many as ever he could get of that subject. And among them all, none pleased him better than those which famous Felician of Silva composed. For the smoothness of his prose, with now and then some intricate sentence meddled, seemed to him peerless; and principally when he did read the courtings, or letters of challenge, that knights sent to ladies, or one to another; where, in many places, he found written: ‘The reason of the unreasonableness which against my reason is wrought, doth so weaken my reason, as with all reason I do justly complain on your beauty.’ And also when he read: ‘The high heavens, which with your divinity do fortify you divinely with the stars, and make you deserveress of the deserts which your greatness deserves,’ etc. With these and other such passages the poor gentleman grew distracted, and was breaking his brains day and night, to understand and unbowel their sense, an endless labour; for even Aristotle himself would not understand them, though he were again resuscitated only for that purpose. He did not like so much the unproportionate blows that Don Belianis gave and took in fight; for, as he imagined, were the surgeons never so cunning that cured them, yet was it impossible but that the patient his face and all his body must remain full of scars and tokens. Yet did he praise, notwithstanding, in the author of that history, the conclusion of his book, with the promise of the Endless Adventure; and many times he himself had a desire to take pen and finish it exactly, as it is there promised; and would doubtless have performed it, and that certes with happy success, if other more urgent and continual thoughts had not disturbed him. Many times did he fall at variance with the curate of his village (who was a learned man, graduated in Ciguenca) touching who was the better knight, Palmerin of England, or Amadis de Gaul. But Master Nicholas, the barber of the same town, would affirm that none of both arrived in worth to the Knight of the Sun; and if any one knight might paragon with him, it was infallibly Don Galaor, Amadis de Gaul’s brother, whose nature might fitly be accommodated to anything; for he was not so coy and whining a knight as his brother, and that in matters of valour he did not bate him an ace. In resolution, he plunged himself so deeply in his reading of these books, as he spent many times in the lecture of them whole days and nights; and in the end, through his little sleep and much reading, he dried up his brains in such sort as he lost wholly his judgment. His fantasy was filled with those things that he read, of enchantments, quarrels, battles, challenges, wounds, wooings, loves, tempests, and other impossible follies. And these toys did so firmly possess his imagination with an infallible opinion that all that machina of dreamed inventions which he read was true, as he accounted no history in the world to be so certain and sincere as they were. He was wont to say, that the Cid Ruy Diaz was a very good knight, but not to be compared to the Knight of the Burning Sword, which, with one thwart blow, cut asunder two fierce and mighty giants. He agreed better with Bernardo del Carpio, because he slew the enchanted Roland in Roncesvalles. He likewise liked of the shift Hercules used when he smothered Anteon, the son of the earth, between his arms. He praised the giant Morgant marvellously, because, though he was of that monstrous progeny, who are commonly all of them proud and rude, yet he was affable and courteous. But he agreed best of all with Reinauld of Mount Alban; and most of all then, when he saw him sally out of his castle to rob as many as ever he could meet; and when, moreover, he robbed the idol of Mahomet, made all of gold, as his history recounts, and would be content to give his old woman, yea, and his niece also, for a good opportunity on the traitor Galalon, that he might lamb-skin and trample him into powder. Finally, his wit being wholly extinguished, he fell into one of the strangest conceits that ever madman stumbled on in this world; to wit, it seemed unto him very requisite and behooveful, as well for the augmentation of his honour as also for the benefit of the commonwealth, that he himself should become a knight-errant, and go throughout the world, with his horse and armour, to seek adventures, and practise in person all that he had read was used by knights of yore; revenging of all kinds of injuries, and offering himself to occasions and dangers, which, being once happily achieved, might gain him eternal renown. The poor soul did already figure himself crowned, through the valour of his arm, at least Emperor of Trapisonda; and led thus by these soothing thoughts, and borne away with the exceeding delight he found in them, he hastened all that he might, to effect his urging desires. And first of all he caused certain old rusty arms to be scoured, that belonged to his great-grandfather, and lay many ages neglected and forgotten in a by-corner of his house; he trimmed and dressed them the best he might, and then perceived a great defect they had; for they wanted a helmet, and had only a plain morion; but he by his industry supplied that want, and framed, with certain papers pasted together, a beaver for his morion. True it is, that to make trial whether his pasted beaver was strong enough, and might abide the adventure of a blow, he out with his sword and gave it a blow or two, and with the very first did quite undo his whole week’s labour. The facility wherewithal it was dissolved liked him nothing; wherefore, to assure himself better the next time from the like danger, he made it anew, placing certain iron bars within it, in so artificial a manner, as he rested at once satisfied, both with his invention, and also the solidity of the work; and without making a second trial, he deputed and held it in estimation of a most excellent beaver. Then did he presently visit his horse, who (though he had more quarters than pence in a sixpence, through leanness, and more faults than Gonella’s), having nothing on him but skin and bone; yet he thought that neither Alexander’s Bucephalus, nor the Cid his horse Balieca, were in any respect equal to him. He spent four days devising him a name; for (as he reasoned to himself) it was not fit that so famous a knight’s horse, and chiefly being so good a beast, should want a known name; and therefore he endeavoured to give him such a one as should both declare what sometime he had been, before he pertained to a knight-errant, and also what at present he was; for it stood greatly with reason, seeing his lord and master changed his estate and vocation, that he should alter likewise his denomination, and get a new one, that were famous and altisonant, as became the new order and exercise which he now professed; and therefore, after many other names which he framed, blotted out, rejected, added, undid, and turned again to frame in his memory and imagination, he finally concluded to name him Rozinante, a name in his opinion lofty, full, and significant of what he had been when he was a plain jade, before he was exalted to his new dignity; being, as he thought, the best carriage beast of the world. 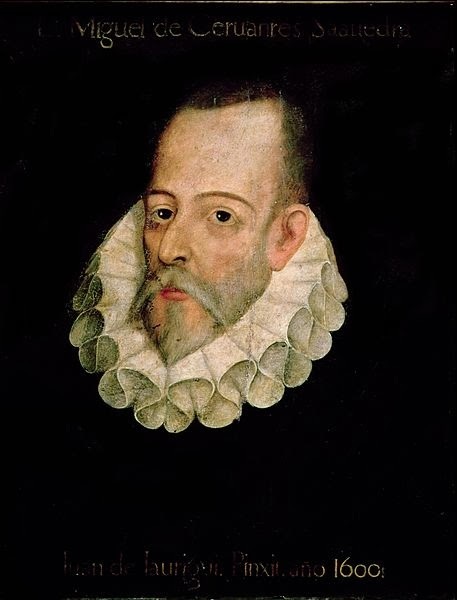 The name being thus given to his horse, and so to his mind, he resolved to give himself a name also; and in that thought he laboured other eight days; and, in conclusion, called himself Don Quixote; whence (as is said) the authors of this most true history deduce, that he was undoubtedly named Quixada, and not Quesada, as others would have it. And remembering that the valorous Amadis was not satisfied only with the dry name of Amadis, but added thereunto the name of his kingdom and country, to render his own more redoubted, terming himself Amadis de Gaul; so he, like a good knight, would add to his own that also of his province, and call himself Don Quixote of the Mancha, wherewith it appeared that he very lively declared his lineage and country, which he did honour, by taking it for his surname. His armour being scoured, his morion transformed into a helmet, his horse named, and himself confirmed with a new name also, he forthwith bethought himself, that now he wanted nothing but a lady on whom he might bestow his service and affection; for the knight-errant that is loveless resembles a tree that wants leaves and fruit, or a body without a soul: and therefore he was wont to say, ‘If I should for my sins, or by good hap, encounter there abroad with some giant (as knights-errant do ordinarily), and that I should overthrow him with one blow to the ground, or cut him with a stroke in two halves, or finally overcome, and make him yield to me, would it not be very expedient to have some lady to whom I might present him? And that he, entering in her presence, do kneel before my sweet lady, and say unto her, with an humble and submissive voice, “Madam, I am the giant Caraculiambro, lord of the island called Malindrania, whom the never-too-much-praised knight, Don Quixote de la Mancha, hath overcome in single combat; and hath commanded to present myself to your greatness, that it may please your highness to dispose of me according unto your liking!”’ Oh, how glad was our knight when he had made this discourse to himself, but chiefly when he had found out one whom he might call his lady! For, as it is imagined, there dwelt in the next village unto his manor, a young handsome wench, with whom he was sometime in love, although, as is understood, she never knew or took notice thereof. She was called Aldonsa Lorenzo, and her he thought fittest to entitle with the name of Lady of his thoughts, and searching a name for her that should not vary much from her own, and yet should draw and aveer somewhat to that of a princess or great lady, he called her Dulcinea del Toboso (for there she was born), a name is his conceit harmonious, strange, and significant, like to all the others that he had given to his things. THINGS being thus ordered, he would defer the execution of his designs no longer, being spurred on the more vehemently by the want which he esteemed his delays wrought in the world, according to the wrongs that he resolved to right, the harms he meant to redress, the excesses he would amend, the abuses that he would better, and the debts he would satisfy. And therefore, without acquainting any living creature with his intentions, he, unseen of any, upon a certain morning, somewhat before the day (being one of the warmest of July), armed himself cap-a-pie, mounted on Rozinante, laced on his ill-contrived helmet, embraced his target, took his lance, and by a postern door of his base-court issued out to the field, marvellous jocund and content to see with what facility he had commenced his good desires. But scarce had he sallied to the fields, when he was suddenly assaulted by a terrible thought, and such a one as did well-nigh overthrow his former good purposes; which was, he remembered he was not yet dubbed knight, and therefore, by the laws of knighthood, neither could nor ought to combat with any knight: and though he were one, yet ought he to wear white armour like a new knight, without any device in his shield until he did win it by force of arms. These thoughts did make him stagger in his purposes; but his follies prevailing more than any other reason, he purposed to cause himself to be knighted by the first he met, to the imitation of many others that did the same, as he had read in the books which distracted him. As touching white armour, he resolved, with the first opportunity, to scour his own so well, that they should rest whiter than ermines. And thus he pacified his mind and prosecuted his journey, without choosing any other way than that which his horse pleased, believing that therein consisted the vigour of knightly adventures. Our burnished adventurer, travelling thus onward, did parley with himself in this manner: ‘Who doubts, in the ensuing ages, when the true history of my famous acts shall come to light, but that the wise man who shall write it, will begin it, when he comes to declare this my first sally so early in the morning, after this manner?—“Scarce had the ruddy Apollo spread over the face of the vast and spacious earth the golden twists of his beautiful hairs, and scarce had the little enamelled birds with their naked tongues saluted with sweet and mellifluous harmony the arrival of rosy Aurora, when, abandoning her jealous husband’s soft couch, she shows herself to mortal wights through the gates and windows of the Manchegall horizon; when the famous knight, Don Quixote of the Mancha, abandoning the slothful plumes, did mount upon his renowned horse Rozinante, and began to travel through the ancient and known fields of Montiel”’ (as indeed he did). And following still on with his discourse, he said: ‘Oh, happy the age, and fortunate the time, wherein my famous feats shall be revealed, feats worthy to be graven in brass, carved in marble, and delivered with most curious art in tables, for a future instruction and memory. And, thou wise enchanter, whosoever thou beest, whom it shall concern to be the chronicler of this strange history, I desire thee not to forget my good horse Rozinante, mine eternal and inseparable companion in all my journeys and courses.’ And then, as if he were verily enamoured, he said: ‘O Princess Dulcinea! lady of this captive heart! much wrong hast thou done me by dismissing me, and reproaching me with the rigorous decree and commandment, not to appear before thy beauty. I pray thee, sweet lady, deign to remember thee of this poor subjected heart, that for thy love suffers so many tortures!’ And with these words he inserted a thousand other ravings, all after the same manner that his books taught him, imitating as near as he could their very phrase and language, and did ride therewithal so slow a pace, and the sun did mount so swiftly, and with so great heat, as it was sufficient to melt his brains, if he had had any left. The wenches being unaccustomed to hear so rhetorical terms, answered never a word to him, but only demanded whether he would eat anything. “That I would,’ replied Don Quixote, ‘forasmuch as I think the taking of a little meat would be very behooveful for me.’ It chanced by hap to be on Friday, and therefore there was no other meat in the inn than a few pieces of a fish called in Castile abadexo, in Andalusia bacallao, and in some placescuradillo, and in others truchuela, and is but poor-john. They demanded of him, therefore, whether he would eat thereof, giving it the name, used in that place, of truchuela, or little trout; for there was no other fish in all the inn to present unto him but such. ‘Why, then,’ quoth Don Quixote, ‘bring it in; for if there be many little trouts they may serve me instead of a great one; it being all one to me, to be paid my money (if I were to receive any) in eight single reals, or to be paid the same in one real of eight. And, moreover, those little trouts are perhaps like unto veal, which is much more delicate flesh than beef; or the kid, which is better than the goat; but be it what it list, let it be brought in presently; for the labour and weight of arms cannot be well borne without the well-supplying of the guts.’ Then was there straight laid a table at the inn door, that he mought take the air; and the host brought him a portion of evil-watered and worse-boiled poor-john, and a loaf as black and hoary as his harness. But the only sport was to behold him eat; for by reason his helmet was on, and his beaver lifted, he could put nothing into his mouth himself if others did not help him to find the way, and therefore one of those ladies served his turn in that; but it was altogether impossible to give him drink after that manner, and would have remained so for ever, if the innkeeper had not bored a cane, and setting the one end in his mouth, poured down the wine at the other: all which he suffered most patiently, because he would not break the ribbons of his helmet. And as he sat at supper, there arrived by chance a sowgelder, who, as soon as he came to the inn, did sound four or five times a whistle of canes, the which did confirm Don Quixote that he was in some famous castle, where he was served with music; and that the poor-john was trouts; the bread of the finest flour; the whores, ladies; and the innkeeper, constable of that castle; wherefore he accounted his resolution and departure from his own house very well employed. But that which did most afflict him was, that he was not yet dubbed knight, forasmuch as he was fully persuaded that he could not lawfully enterprise, or follow any adventure, until he received the order of knighthood.